As we begin a new year, La'o Hamutuk is making the 2013 budget books prepared by the Ministry of Finance available on our website with summary information and preliminary analysis. Update 21 January: La'o Hamutuk testified before two committees of the RDTL National Parliament last week. Download our submission in Tetum or English. The total budget will be $1.8 billion, about the same as in 2012. About one-fourth of it will be financed with unspent money in the Infrastructure and Human Capital Development Funds, reducing the anticipated withdrawal from the Petroleum Fund in 2013 to $1.2 billion. This is 4.6% of Timor-Leste's anticipated petroleum wealth less unsustainable than the $1.5 billion the Government withdrew from the Petroleum Fund during 2012. Although capital expenditure will be less than in 2012, recurrent expenditure will increase by 20%. 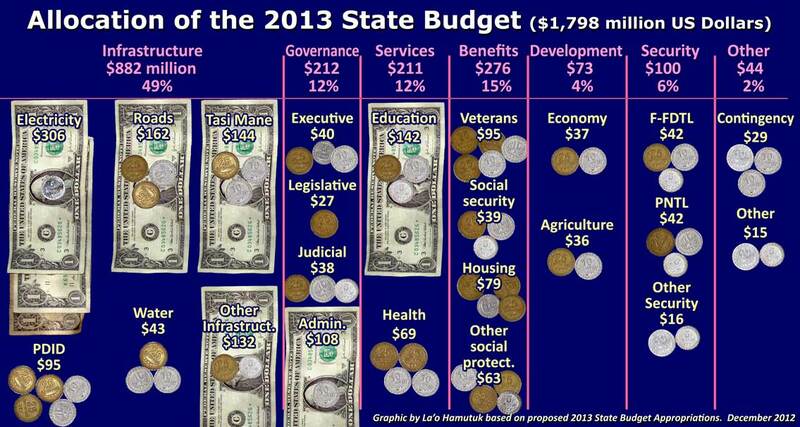 For more information and analysis, see La'o Hamutuk's web page on the 2013 budget. We have also published the final Budget Book for the October 2012 mid-year rectification. The following table does not include the Special Funds, but summarizes appropriations from the Consolidated Fund for the recently revised 2012 budget and the proposal for 2012.